Divers Sara Weber, left, and Lawson Godwin finished second and third, respectively. 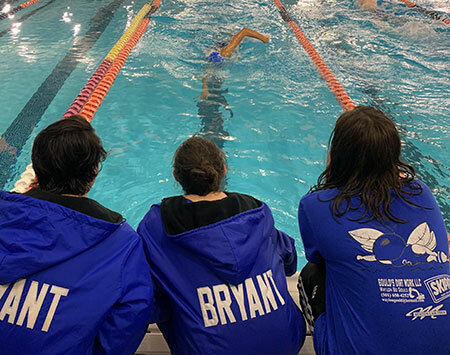 CONWAY — Last week, Bryant freshman Shelby Bratton set a school record in the 200-meter individual medley only to find out she’d been DQ’d. So, Friday, at the 6A-Central Conference championship meet at UCA, she did it again and it counted. Bratton turned in a time of 2:17.80, topping the old mark of 2:18.87, set by Jinson Kang. It was good for a third-place finish and qualified her for the State meet. Cabot’s Jessica Bonfeldt (2:09.97) and Conway’s Brooklyn Anderson (2:11.16) finished first and second, respectively. For Bryant, Jasmine Snell was 14thin 3:02.65 and Michelle Altankhuyag was 16thin 3:07.29. 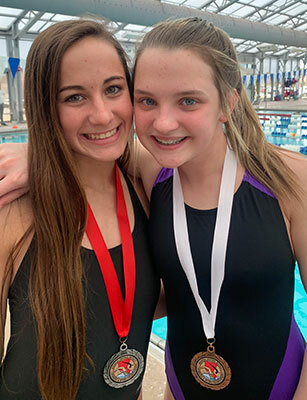 In addition, the Lady Hornets 200-yard freestyle relay team of Ella Reynolds, Kayla Vaughan, Alana Gould and Bratton turned in a State-qualifying fourth-place finish in 1:48.60. Bryant’s girls finished fourth with 226 points. Conway won the team championship with 427, eking it out over Cabot by one point. Little Rock Central was third with 413 in the seven-team meet. The Bryant boys finished with 130 points, good for fifth. Little Rock Central won the team title with 524 points to Conway’s 486. Cabot was third (435) then Little Rock Catholic was a distant fourth with 152. 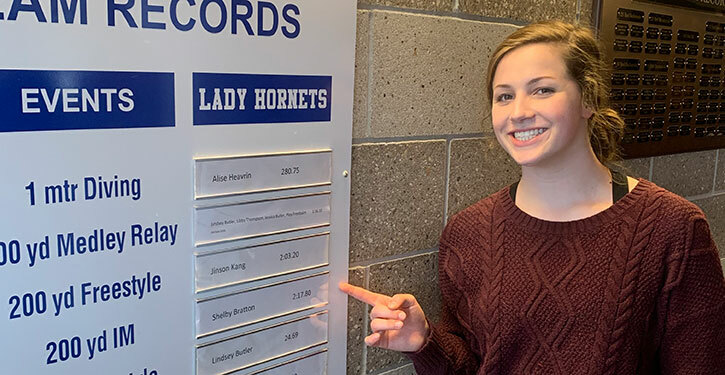 The Lady Hornets actually scored best in the one-meter dive, held Wednesday at Hendrix College, where Sara Weber was second with a score of 260.30 and Lawson Godwin was third at 233.95. Conway’s Anna Kathleen Harris won the event with an impressive score of 361.45. The Hornets’ top finish came in the 400-yard freestyle relay in which Carson Edmonson, Jalen Dinstbier, Gavin Miller and Sam Vinson combined on a 3:58.25 to finish fifth. In the diving competition, Bryant’s top diver, Caivon Crosby was DQ’d. Still, LaQuav Brumfield, Donte Baker and Shane Morris all scored. Brumfield was seventh with a score of 164.60. Baker was seventh at 160.65 and Morris eighth at 159.00. For the Lady Hornets, another freshman Aidan Halladay picked up fourth-place points in the 200-yard freestyle in a time of 2:19.58. Alyssa Addison was 12thin 2:39.29. 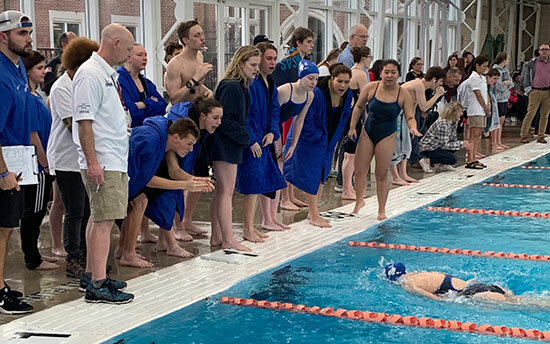 Fifth-place finishes were turned in by Ella Reynolds, individually, and the 200 medley relay which included Reynolds, Alana Gould, Bratton and Vaughan. The relay time was 2:03.58. Reynolds was fifth in the 50 free, turning in a 26.78 with Gould sixth in 26.85. Hailey Addison, Alyssa Addison, Dayanne Maldonado and Halladay combined on a 4:37.59 to take sixth. Bratton added a seventh-place finish in the 100 butterfly with a time of 1:05.37 while Halladay was ninth in the 500 free (6:18.85) with Alyssa Addison 13thin 7:05.33. Vaughan added 11th-place points in the 100 free in a time of 1:07.19. Hailey Addison was 13thin 1:08.77 then was 15thin the 100-yard breast stroke (1:28.70) with Vaughan 16thin 1:31.35. Reynolds contributed 13th-place points in the 100-yard backstroke, clocking in at 1:16.59. For the boys, the team of Edmonson, Brumfield, Vinson and Hayden Smith put together a 1:42.25 to finish sixth in the 200 free relay then Smith, Miller, Brumfield and Dinstbier teamed up on a 1:54.97 to place seventh in the 200 medley relay. Vinson was 14thin the 100 backstroke in 1:04.90 and Smith was 14thin the 50 free with a time of 24.85. Vinson was also 15thin the 200 IM, clocking in at 2:21.14 with Dinstbier 16thin 2:34.10. Dinstbier’s 6:39.71 in the 500 free was good for 15th-place points as well. Tyler Peters was 15thin the 200 free (2:12.03) while Miller was 16thin both the 100 butterfly (1:08.63) and the 100 breast (1:09.65). The Class 6A State meet is Feb. 22 (diving) and 23 (swimming) at Bentonville.